Long strangle is very rewarding if market moves in any one direction rapidly. The last one word is very important – the market has to move in any one direction – up or down – RAPIDLY or Fast. 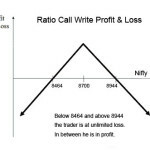 If it does the long strangle trader will make unlimited amount of money else the losses are limited. I actually hate this “unlimited amount of money” thing. I mean really? When was the last time you made unlimited amount of money? Somewhere a trader will book his profits. Why these so called experts say on this, and some other strategies like options buying can make unlimited amount of money, is what I fail to understand. Unfortunately technically I have to write this that long strangle makes unlimited amount of money and losses only limited amount of money. Please don’t fall for this trap though. Predicting market direction is difficult if not impossible. However you can see that with this strategy you only have to predict if the markets will move fast and deep in one direction – the direction itself is not important. So here there are some advantages. We will look at that later. 1. Buy option or options on the Call side any strike price. 2. Buy the same number of options on the same underlying Put side any strike price different than Call strike price. Note: Most traders buy out of the money options for both calls and puts. How far depends on the trader. So lets say if you feel Nifty will move within a few days very fast in one direction, due to the upcoming budget on 10th of July, 2014 – you can buy an OTM Call option strike price 7800. And at the same time you can buy a OTM put strike price of 7200. Nifty currently at the time of writing this article is at 7504. Once the trade is complete you just bought a long strangle. Once you have put the long strangle trade you should know your break even point. How to calculate the break even points of long strangle? Add both the points of call and put option. Now when selling you should get the same points – and that is your break even point. Since usually traders do not leave this position till expiry I will not calculate the break even point till expiry. In our example our break even is: 56+42 = 98. If you need to make a profit, you need more than 98 points in total while selling the call and the put option. Disclaimer: By the time this goes live on my blog these prices may have changed. Please do not trade this strategy just because it is mentioned here. This is for example only. Note: You can literally buy ANY strike price of these options. If they are of the same strike they will be technically called Long Straddle. Both the Long Straddle and Long Strangle will profit if markets take a fast direction either side. However the difference lies in the money you have to pay upfront to buy these options. In a Long Straddle you will have to pay more as either both of the options will be ATM or one of them will be deep in the money. However with long strangle your costs will be less as usually traders buy options out of the money for both the calls and puts. This will limit your risk. Imagine you bought options closer to the money – you would have to pay more for the strangle. And if the markets did not move and stayed in a range – you will lose much faster than someone who bought the out of the money options. On the other side if markets did not make a significant move but still made a good move – there is a chance that the trader who bought options closer to money will make a profit, but the trader who bought the OTM options may lose money. You see options closer to the money will move faster than the options that are further out of the money. So if the markets are going up – the closer to the money call options will increase in value faster than the OTM calls. Of course the near the money puts will also be losing money fast, but this strategy is profitable only when the market move is significant. If the value of one option moves faster than the one which is losing money – the trade makes money. If the options are deep out of the money it needs a big and substantial move for it to be profitable. If that move does not happen – the trade will lose money. If the move is indeed significant the trader who bought the OTM options will make more than the one who bought the options closer to the money. Simply because there is not much to lose in any of the option. It takes us back to the question. Which options to buy when playing the long strangle? Very tricky to answer this one but I will try. First of all you should trade this strategy only when the markets are expecting major moves. On top of that you should have in mind a risk that you are willing to take. Do not over trade just because you think the markets will move. It may but you may still lose money. If there is a really major news like general election results, budget declaration, or may be a war between two or more countries – you should buy deep out of the money options. Why? Because the markets may give a knee jerk reaction. In such a case OTM options in long strangle trade will be more profitable. 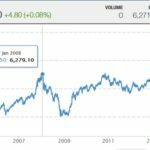 If the news is as simple as a stock’s quarterly earnings reports or IIP data – you should buy near the money options. Because there may not be a significant move, but a 3% or more should do the trick. Another note: If trading this strategy please do not wait for unlimited income. There is no trap like unlimited income. You should have a target in mind. Once it is reached – just close the trade. In fact once the news is out you should close both the options – calls and puts – either in profit or in loss. Don’t be greedy. Some traders I know only close the option that is losing money. Well you don’t know when the markets will take a turn. In that case all your profits may vanish and you have already taken a loss in the other option. That’s a bad decision. Close both the trades as soon as your profit target is reached or the stop loss is hit. If markets moved further do not feel bad that you closed the trade earlier – you made a profit and you should be happy. You know what I do once I close a trade either in profit or a loss. I simply forget the trade. If there was something to learn I write it down in my research papers but I do not look back and try to figure out had I waited what would have happened. That for me is a waste of time. So what I do if markets do not move the day of the news? I simply close the options at a small loss. I do not wait for the markets to move. If they haven’t moved after the news, they will not move because you have traded long strangle. Just close the trade. Similarly if markets move very strongly the news day I close the trade before the European markets open and be happy with my profits. Then I start thinking about my next trade. Long Strangles are highly dependent on volatility. Before the news volatility is usually high. Unfortunately because of this the option buyers have to pay a high premium to the sellers. And here is some more bad news – once the news is out there is no more anxiety, therefore the volatility crunches. This means the values of the options erodes on the day of the results. Which means a long strangle buyer will have to fight not only movement but also volatility. How tough is that? Due to Indian’s general elections results to be declared on 16th May 2014 a trader took a long strangle position on 14th May 2014. He decided to buy far OTM calls and puts as the day of the results can give the markets a knee jerk reaction. For simplicity lets take closing prices. On 14th May 2014 Nifty closed at 7108. India VIX (the volatility) was 32.40. Nifty makes a high very fast of 7563. India VIX crushed to 24.29. A 25% drop. 7500 CE made a high of 232. 6700 PE made a low of 6. Lets suppose the trades closed the call at 210. Lets see how much he gets back when selling the long strangle. Total profit: 21600 – 17000 = 4600. ROI: (4600/17000) * 100 = 27.05% in 2 days. Isn’t this a great return? On 14th May 2014 the near to the money calls were so costly that I think probably institutional investors only bought them. For example LTP of 7200 CE was 196 and LTP of 7000 PE was 168. Total points 196+168 = 364. For two lots your total investment would have been 36,400. I am personally not in favor of taking this much of a risk. Of course you can trade with one lot. The more costly the option prices – the more the risk. Did you notice one thing? Volatility crushed by 25% still long strangle traders made money. This was possible because Nifty moved significantly in one direction raising the prices of the calls to even defeat the volatility. If Nifty stayed there or would not have moved significantly, the option prices would have reduced dramatically and sellers would have won. As I told you earlier, volatility cannot beat the speed of the movement of the stock. If its significant, volatility has a small role to play, if not for long options it can be a killer. 1. Long Strangle is buying both call and the put option of the same underlying but different strike prices. 2. Usually traded before an important news or event. 3. Do not wait till expiry. Once the news is out close your position either in profit or a loss. You can wait for maximum of two days in extreme cases. 4. Long strangle should not be traded too often as option buyers mostly lose money. I agree with your observations in this article. I have personally found that Bank Nifty is more suited for this strategy since it has huge movements (intra day range can be 1000 points on a volatile day). On a downside, the premium is also high and hence the initial investment will be more compared to NIFTY. Buying CALL and PUT with premium ~250 rupees works best. I have tried to back test on multiple occasions. In my opinion, we also need to ensure that this strategy is not done in last 2 weeks of expiry as the option prices will loose faster on both sides. Closing the position after a decent profit of around 10% of the invested capital (premium of call + put) will be good. Good observations Deepak. Thank You. The only enemy of the Long Strangle is the Volatility Index (VIX). On the one hand if VIX is high, the pro is that the stock will move fast whichever direction it may be, on the other the con is that suddenly the volatility stops and VIX drops – taking away with it the premiums of the options. A trader needs to practice this strategy and if he perfects it – he will know exactly when to get in and get out – and can make a lot of money pretty fast. Practice this with either Nifty or Bank Nifty, NOT both. Money you make or lose is the same, so do not try to prove a point – just master this on either the Nifty or Bank Nifty. Thanks for the good comment Deepak. I am a follower of the Long Strangle and have made/lost money off and on. Yet, I know it is a good strategy. The lacking is in me due to improper judgement at times (aka greed!). I take it as my learning fees. Vijay, you are right. Most people fail in option trading due to greed. Long strangle graph is unlimited profits which comes rarely – not every time. Traders need to realize this. Hi Dilip, Difficult to expect nifty movement. In spite of long strangles short strangles give better results. 45 Days before expiry I sell both bank nifty ATM CE &PE & get approx. 1200 premium . I earn 95% successful trades with the target of 150-200 points. 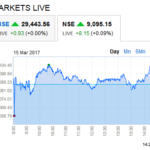 Some time if bank nifty moves 700 – 800 points up. I follow your strategy in your course. Short strangles work great when the stock is range bound and going no where. The problem is when you are caught in a trend. Just one strong movement will destroy months of profits. 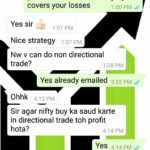 That’s the reason I emphasize on hedging the short trades – you don’t know when they will help you. Happy that my course is helping you. Just keep a strict stop loss if your short strangle is losing money. Presently, in loss on both the legs as market is range bound. Set a target SL and target profit. Exit when whichever comes first. Long strangle is very rewarding if market moves in any one direction rapidly. Long Strangles are highly dependent on volatility. There is no trap like unlimited income. So here there are some advantageous. So here there are some advantages.